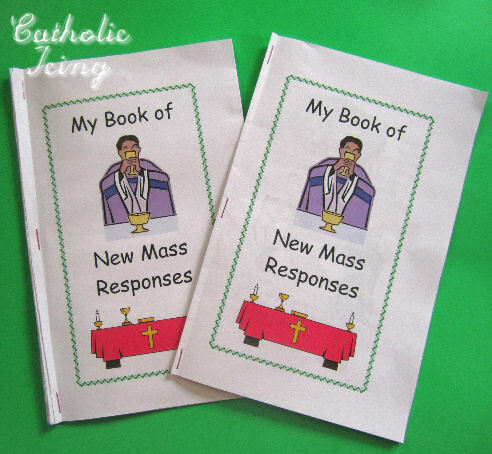 New Mass Responses Booklet for Kids- Free to Print! As I'm sure you all know, beginning on the first Sunday of Advent (2011) we will all begin using the third edition of the Roman Missal, so mass responses are going to change a little. Most of us are going to need to read along for awhile- let's face it- old habits die hard and many of us have been saying to same responses every Sunday for our entire lives. It's time to re-program our brains. This is not a complete child's new mass missal- it just has the parts of the mass that have changed, and it's based on cycle B since that's the year we're moving into.You're all welcome to print it for free! Print page 1, then print page 2 on the back. Print page 3, then print page 4 on the back. Print page 5, then print page 6 on the back. Once you have all 3 papers printed front and back, fold them in half. The individual half-pages have page numbers on them, so that will help you put them together in order. Crease the folds nicely, and staple together. That's it! I really enjoyed putting this together, and I hope you find it useful! I know my children and I will enjoy using these instead of those pew cards. They're just a little more fun and child friendly. Download Your Book of New Mass Responses Here. 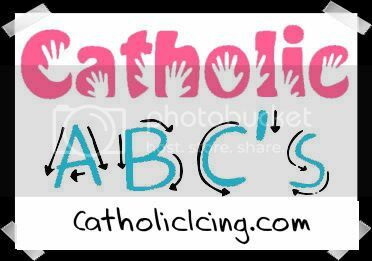 Don't forget to pass this post onto your friends,CCD teachers, and Catholic email lists! Thanks! Advent for Children: Ten Products Under $10! 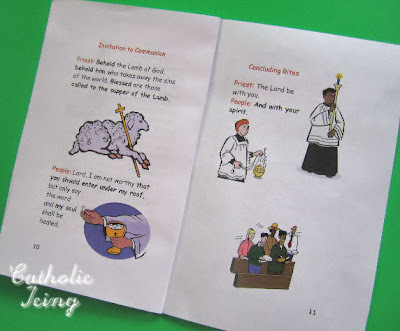 Today I have a guest post for you guys from my friend, Liz, over at Catholic Deals. 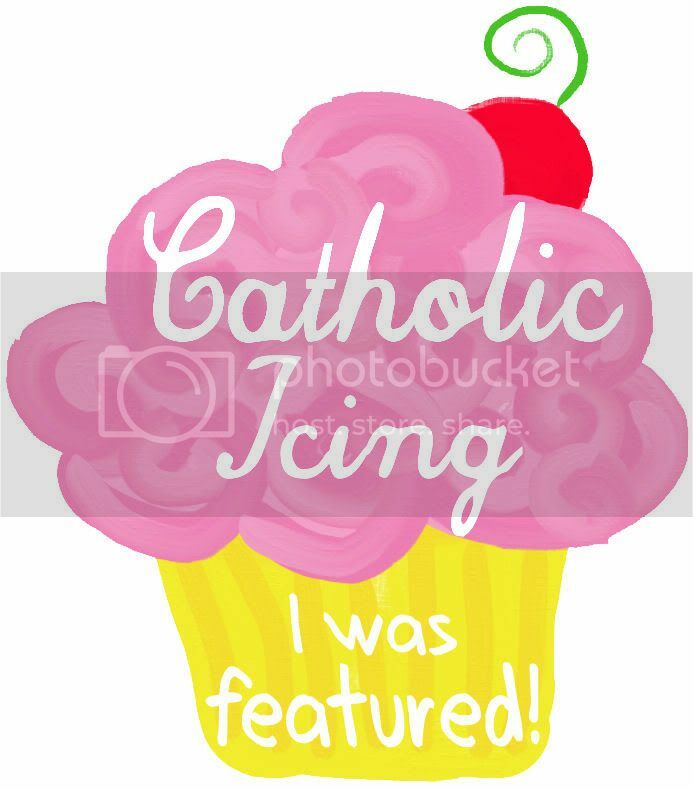 I am in love with her new blog, which is totally devoted to highlighting sales and bargains on Catholic products! If you haven't already subscribed to this blog, you should. Well, that is if you're Catholic and enjoy saving money. ;-) I love that she included several craft kits in this round-up! Advent is coming, and many parents are looking for ways to teach their children about the importance of this season of anticipation. This can seem difficult when the stores are already filled with Christmas merchandise. 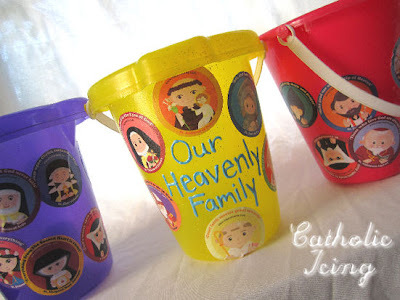 Luckily, there are a lot of great, inexpensive items that will involve your children in the celebration of Advent. Here are ten Advent devotional items for children all under $10. 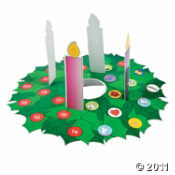 Christianbook has this lovely Fabric Advent Wreath for just $7.99. I love the idea of a touchable Advent wreath that even the youngest children can explore. 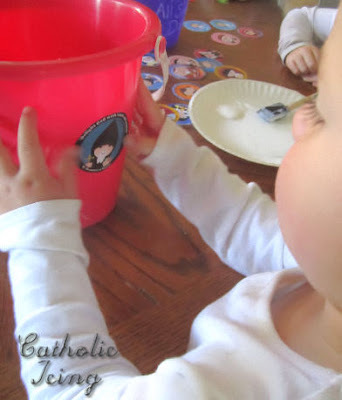 Advent Candles Activity Magnets are another way that children can have their own Advent wreaths. This set is $9.99 and comes with magnetic candles, candle flames, and prayer cards. If your kids would enjoy making their own Advent wreaths, try the the Pop up Advent wreath sticker scene from Oriental Trading for $8 for a dozen. This would be a terrific and easy class project as well. An Advent charm bracelet is a unique reminder of the season. This one from Oriental Trading Company is just $10 for a dozen. 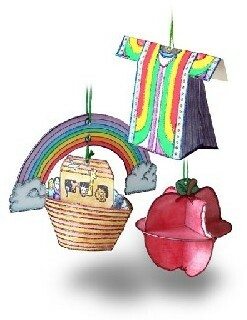 Give some to your children and the rest as gifts to your godchildren or nieces and nephews. 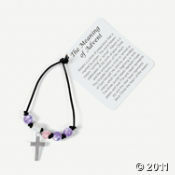 You can also get an Advent Charm Bracelet Craft Kit, which would be a great project for a CCD or Catholic school class. The kit is just $9, and it makes a dozen bracelets. Both the bracelet and the bracelet kit include cards explaining the symbolism of the candles and colors. 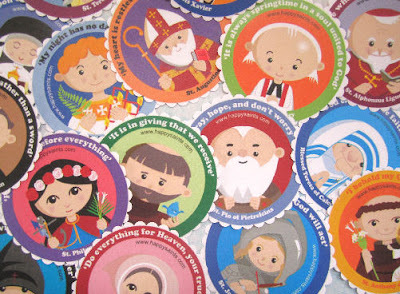 Also from Oriental Trading Company is a Make Your Own Nativity Sticker Advent Calendar. This would also be a great class project, or you could make some with your kids this year and save the rest. At $10 for a dozen, you could stock up for the next several years! If you're looking for a reusable Advent calendar, this foam calendar from Autom is just $1.99 each (in a pack of 4). Many reusable Nativity Advent calendars run from $25 to $50, so this is a terrific value for an item that you can use for several years. Maybe you'd like to try making a Jesse Tree this year but are overwhelmed by the idea of making all the ornaments from scratch. Well, help is at hand. This Jesse Tree Ornament Kit is only $7.50 and contains an explanation fo the Jesse Tree, 12 ready-to-assemble 3-D ornaments, corresponding Bible verses, illustrated instructions, sting, and sequins. 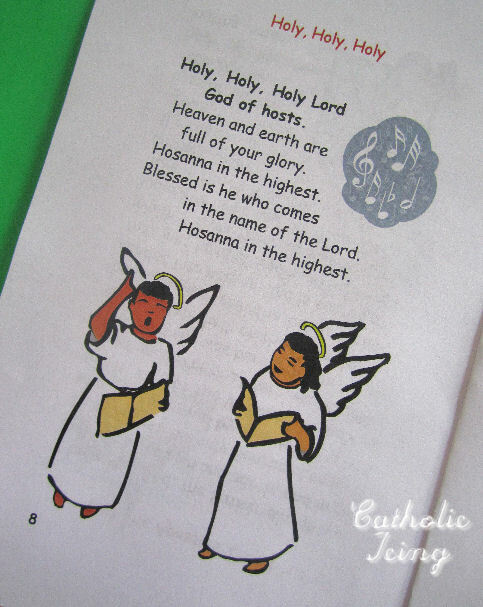 To go along with your Jesse Tree, check out this intriguing storybook that involves the Bible stories of the Jesse Tree. In The Jesse Tree by Geraldine McCaughrean, an old man retells the scriptural stories of Christ's lineage to a young boy. The paperback copy is $9.99 from Christianbook. 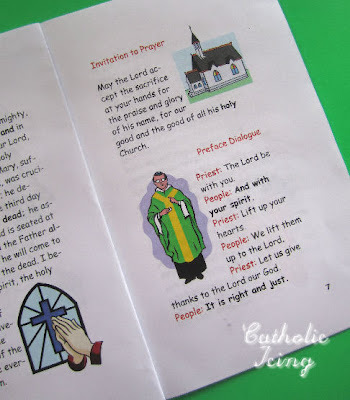 To involve the whole family in Advent prayers and activities, try Getting Ready for Christmas: A Daily Advent Prayer and Activity Book for the Family. 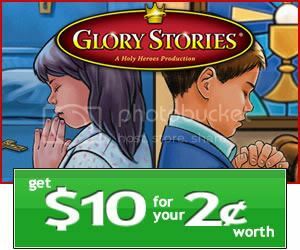 This title is $6.29 for a book and Advent calendar in one, and it includes daily prayers and activities. 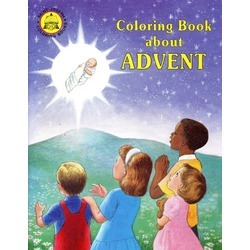 Finally, even the littlest ones can participate in Advent activities with the Advent Coloring Book by Fr. Lovasik. 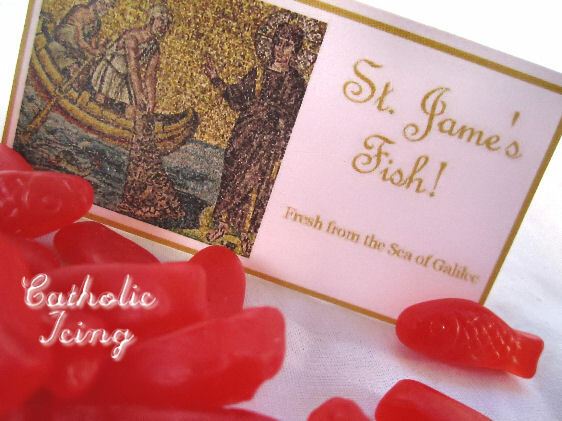 This is just $1.95 from The Catholic Company. 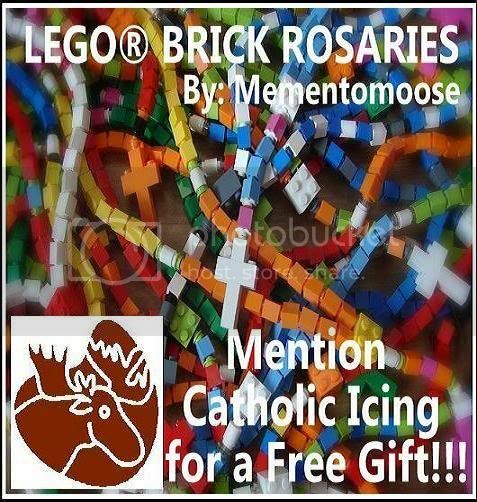 I hope you find the perfect item among these selections to enhance your family worship and your children's anticipation of Christ's coming at Christmas. Liz McGuirk shares deals on Catholic products at Catholic Deals, where she hopes to help families "save money on creating a Catholic home." 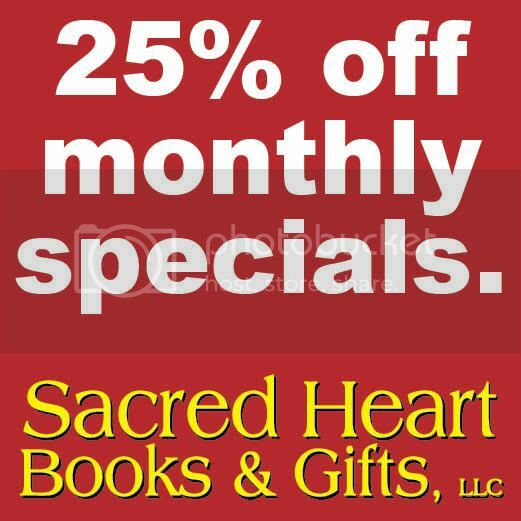 Be sure to follow her by email or on facebook for great deals on Christmas devotional items and gifts, and watch for her upcoming Catholic gift guides for all ages. Yes, I am trying to tell you something with this picture. Do you get it? I thought it was very obvious, but some of my friends were having trouble. So for those of you who didn't get it, this is number 4 for us, and I'm due May 10! 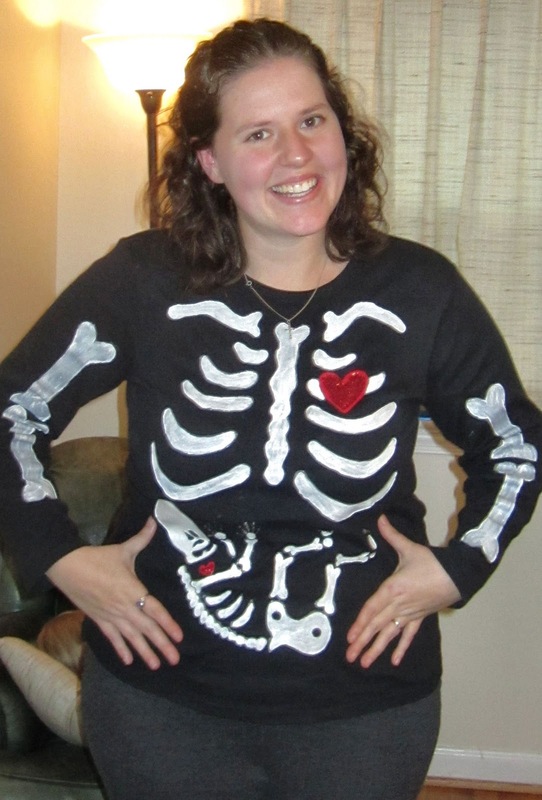 I used this picture to announce my pregnancy on facebook to my friends and family today, and thought you guys might get a kick out of it, too. Anywho, happy All Saints' Day, everyone! 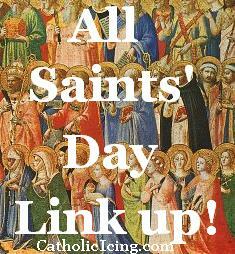 All Saints Day Link Up! Happy (almost) All Saints' Day! 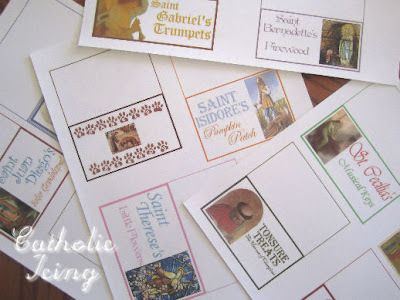 Remember the All Saints' Day linky I had last year? Well, I decided that I didn't want the ideas lost in the archives, and I wanted everyone to keep adding to the collection! So today, I've re-opened the All Saints' Day Link-up! Go ahead... add some links and check out the other ideas. 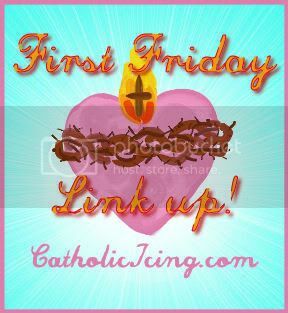 Because I re-opened last year's linky, I changed the settings so the newest things that are linked up show at the top! 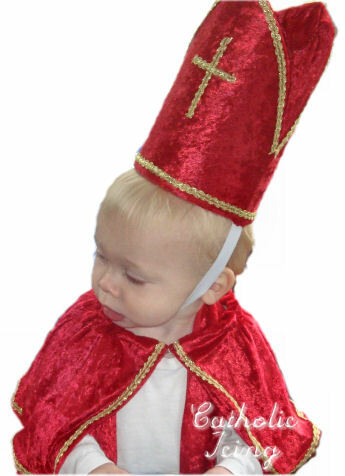 If you just want to share a picture of your kiddos in costume but don't have a blog, go put them on the Catholic Icing facebook page. There's already quite a few pictures there, and some really cute ones! 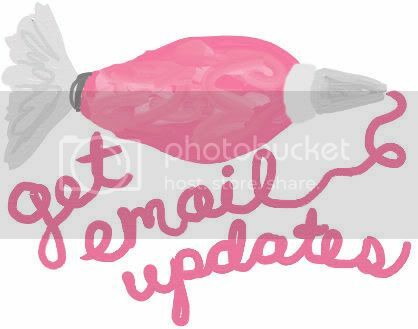 The box below is open for links now, so if you have something ready go ahead and post it! If not, don't sweat it. The box will be open until November 10 so you'll have plenty of time to link what you do this year, too! 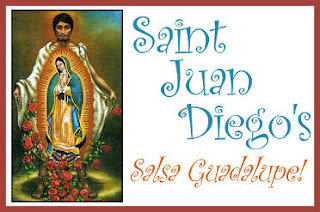 All Saints' and All Souls' Day Ideas including costumes, games, decorations, party ideas, food, celebration ideas... you name it! Link directly to your All Saints'/All Souls' day post - do not enter your generic blog address. Feel free to use your archives and link more than one post as long as it's on topic. Don't forget to link back to this post so everyone knows where to join in the fun! 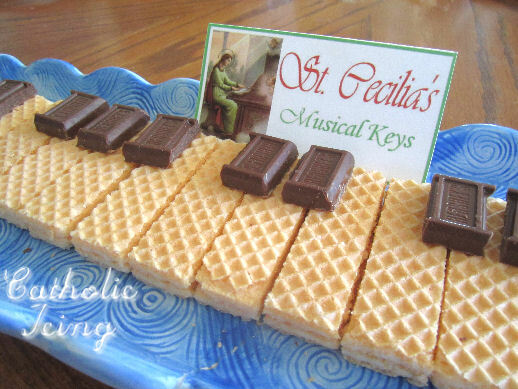 At my house, I work really hard to make being Catholic fun, and I like to make the fun of All Saints' Day rival the fun of Halloween!!! Are you with me?! 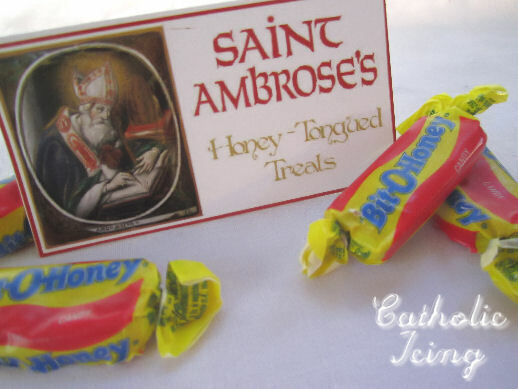 To even the playing field, I think celebrating All Saints' Day should include candy. Whether you're going to an All Saints' Day party where candy will be used as prizes or if you're going trick-or-treating dressed as your favorite religious hero, you'll need a way to carry the goodies you collect. This year, I decided rather than using the pumpkin shaped buckets you see everywhere, we would decorate our very own All Saints' Day candy buckets! I mean, if you can make it Catholic, why not? 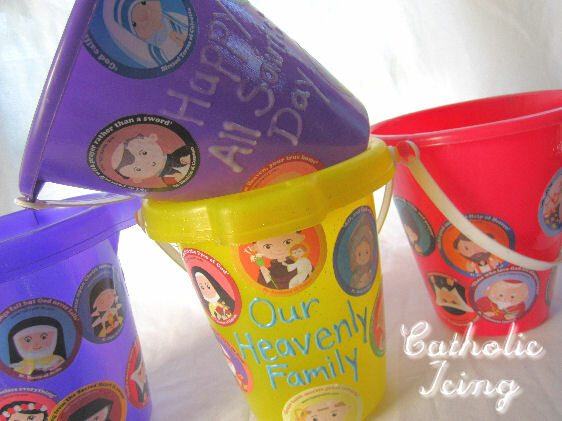 ;-) You could use any bucket, bag, or container, but we used sand pails because we had them on hand. I started by writing messages on them with fabric paint. 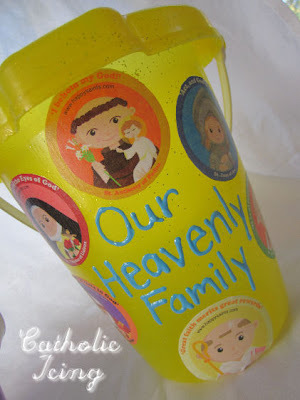 I wrote things like "Happy All Saints' Day", "Pray for Us", and "Our Heavenly Family". 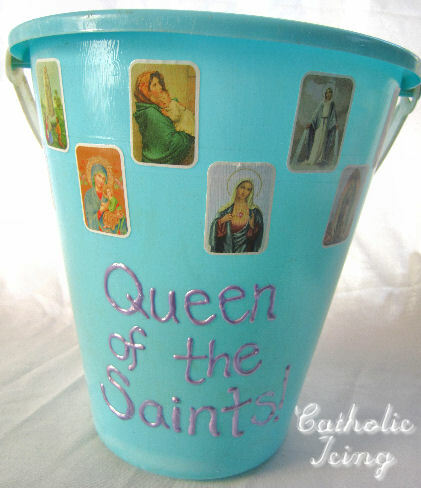 One bucket that has all pictures of Mary says "Queen of the Saints". I also thought about writing "When the Saints Go Marching In", but forgot to. I let the messages dry overnight. Next, you'll need to get some saint stickers, or print some images from the internet. I printed out these adorable saint images from Happy Saints! to use as cupcake toppers for Lydia's CCD class this Sunday. These pictures are so cute! Happy Saints is a great site dedicated to creating cute pictures of the saints to get kids more excited about their faith! 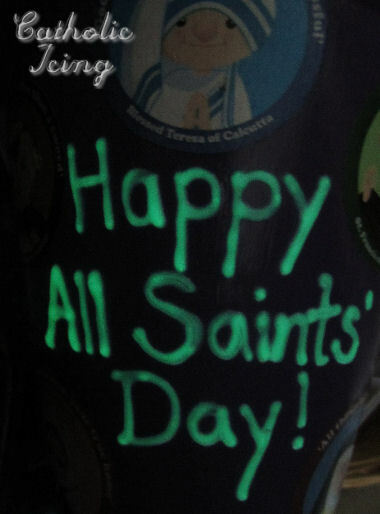 There's actually a Happy Saints store where you can get these images on things like bags, t-shirts, coffee mugs, and you can even get stickers for crafting. 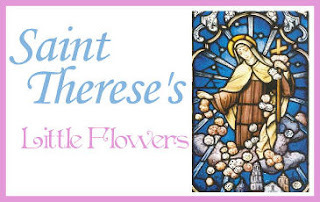 You should keep this store in mind for future presents- the next time I'm a Godmother, my new Godchild will be getting a patron saint onesie as a present for sure! 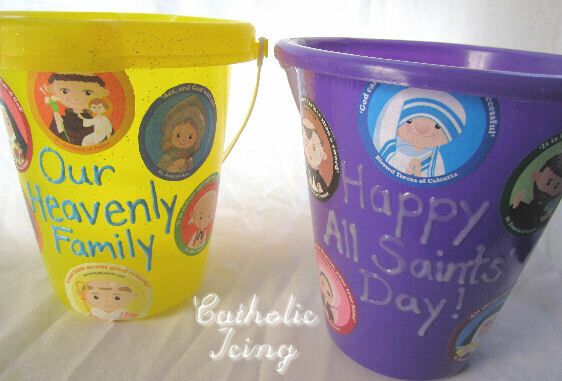 We cut out the circles, and mod-podged them onto the buckets. 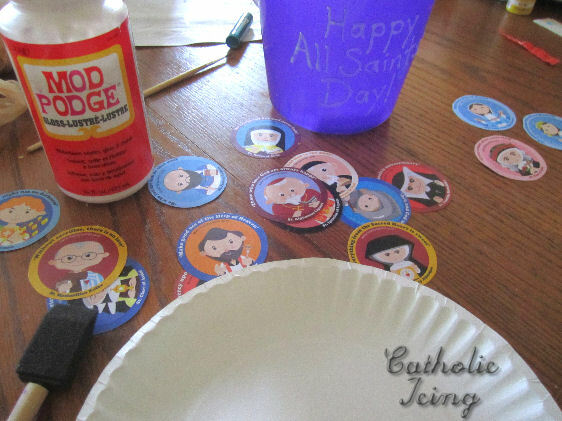 If you don't have any mod-podge, you can just water down a little white glue. (One part white glue, one part water. 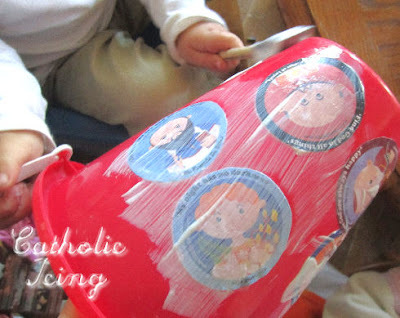 Do NOT use washable glue.) 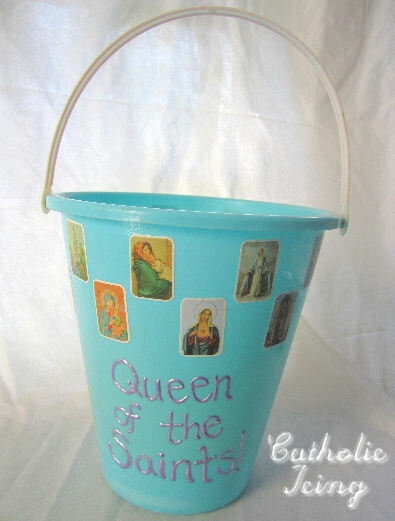 Paint the Mod Podge on the bucket where you want the picture, and stick it on. Once you have all of your images where you want them, take the Mod Podge and paint over the entire outside of the bucket. Yes, even Mod Podge right over your words. For this one, I used Marian stickers that I got at the Dollar Tree. Even though they stuck by themselves, I still Mod Podged over the top to hold them on better and give the bucket a finished look. Plus, the Mod Podge helps keep the fabric paint on there, too. 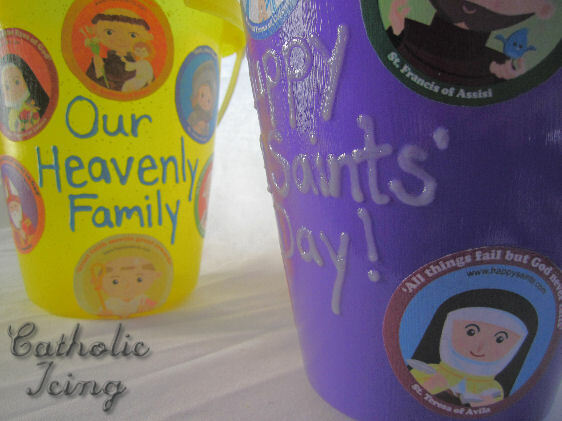 My favorite part- on some of the buckets I used glow in the dark fabric paint. Check it out! I found the glow in the dark paint with the rest of the fabric paint, and I'm glad I saw it because I wouldn't have known to look for it! My kids are really excited about their buckets, and they love the glow in the dark paint. Have fun celebrating All Saints' Day, everyone! Easy Party Food Ideas for All Saints' Day- Downloadable Labels Included! 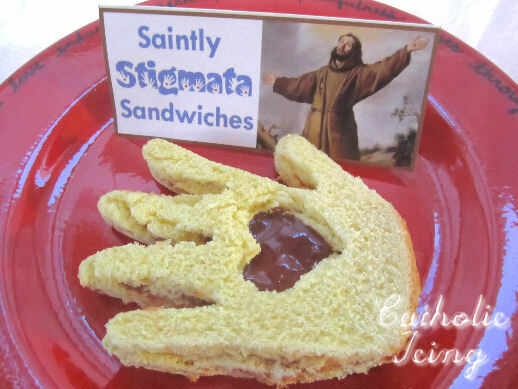 In an effort to make some easy snacks for our All Saints' Day party, I've been brainstorming ways to make every day food into cute Saint food. 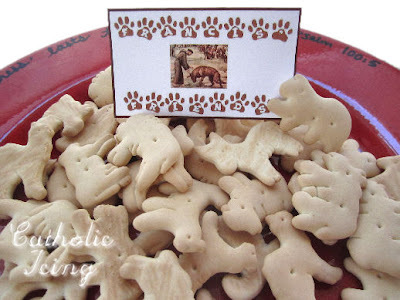 I did this a few years ago by attaching holy cards to bowls of food, such as a St. Francis holy card (Patron saint of animals) on a bowl of animal crackers. candy corns, but any pumpkin treat could go with this label. 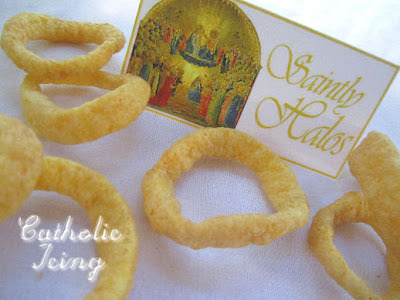 alternative would be to serve some pretty pineapple rings. cute served with Puppy Chow which is Y-U-M-M-Y! 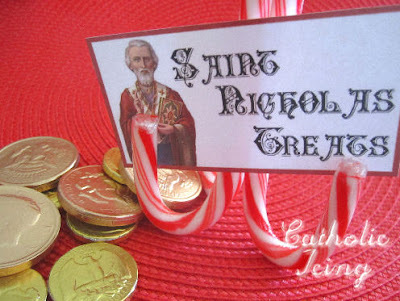 "St. Nicholas Treats"- I kept this one generic on purpose. That way you can either serve candy canes, or chocolate coins. "St. Bernadette's Firewood"- Use with pretzel sticks or pretzel rods. of Lourdes appeared to her. It would be cute to put them in a basket. 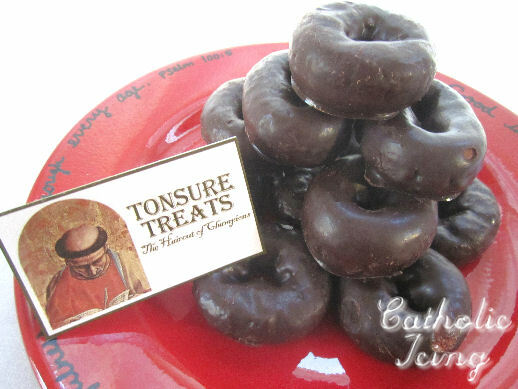 label with mini chocolate doughnuts, or a chocolate bunt cake. "St. James' Fish- Fresh from the Sea of Galilee!" The Typo is now fixed on the downloadable version. Yay! use this label with Goldfish Crackers or Swedish Gummy Fish. and make a hole in the top so the jelly shows through. honey comb cereal, or anything honey or bee related. 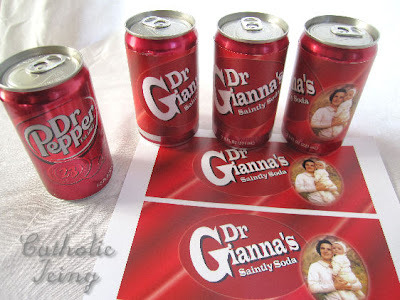 "Dr. Gianna's Saintly Soda"- These are for Dr. Pepper! 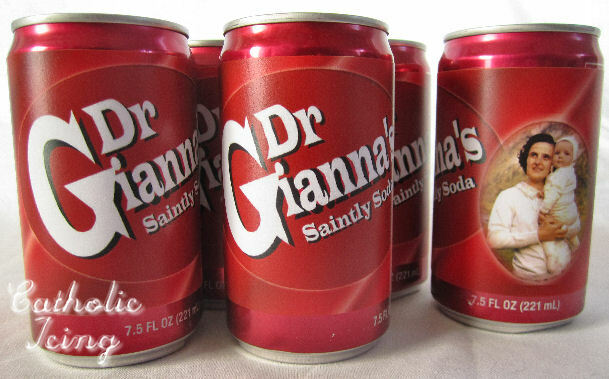 cans by visiting my post about Saintly Soda. or Guadalupe Guacamole... but I don't like guacamole. but the label is there if you want it. 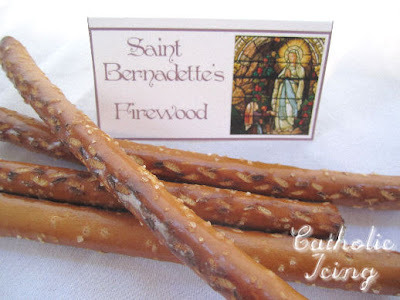 "St. Gabriel's Trumpets"- a label for bugles. Might I suggest chocolate peanut butter bugles? Yum! "St. Therese's Little Flowers"- Use flower shaped butter cookies. was all out. How weird is that? 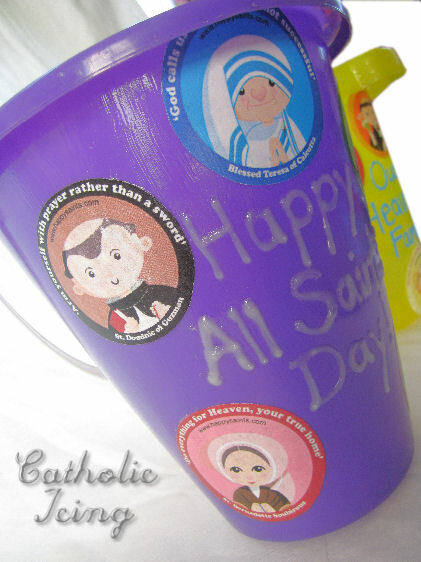 Now you're ready to download the labels and bring some cute food to an All Saints' Day Party! 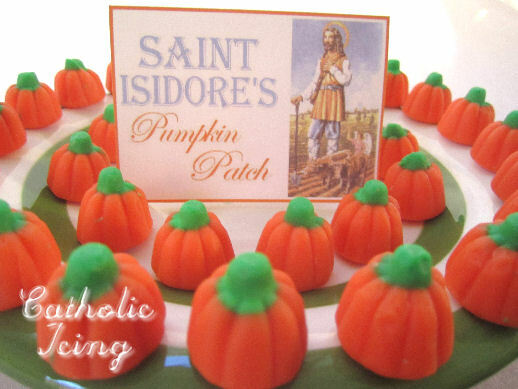 If you're throwing an All Saints' Day party, you can ask those who come to sign up to bring the foods in this post, then have the labels ready when they get to your house. Print the labels onto card-stock, cut them out, and fold in half on the line. 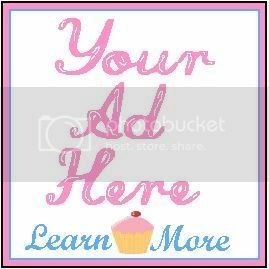 They can stand on your platters or tables like place cards. You can't imagine the amount of ideas I've had running through my head for this post, and as I grocery shopped today. The rest of my ideas will have to wait until next year! I just got finished making some labels for the All Saints' Day party we're going to this weekend, and I wanted to share them with you! 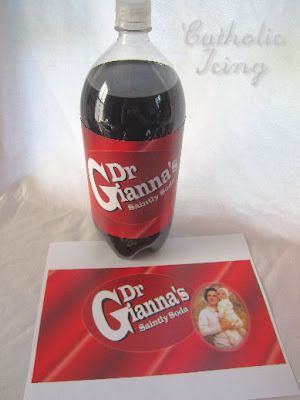 It's a knock off of Dr. Pepper. Check it out! I made 2 different label sizes. One label goes around a 2 liter bottle of soda. The other set of labels prints 3 to a page, and they go around the small cans of Dr. Pepper. 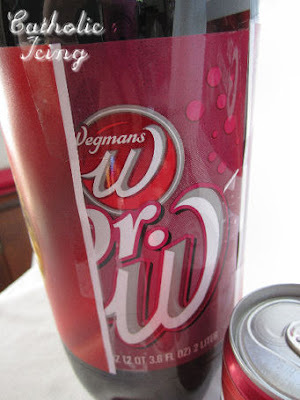 The size of cans I used were the 7.5 FL OZ, and I got them at Wegman's. These are smaller than standard coke cans, but pretty common to find. 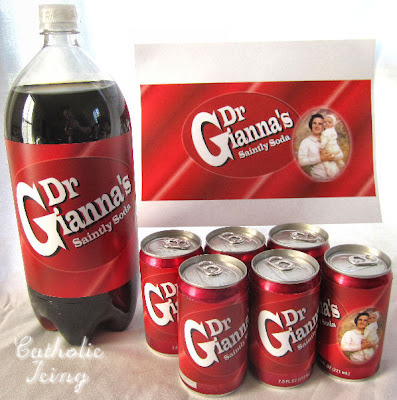 I'm really excited about this "Saintly Soda"! I think it will be a hit at our All Saints' Day party because all of my friends really love Saint Gianna (including me). Just print the labels, cut, and tape them on.